You’ll never walk, You’ll never walk alone. Lots of people in the U.K. think this is a football anthem as it is often performed by the supporters on match day; the tradition began at Liverpool Football Club in the early 60’s and spread to other clubs. I read that Celtic FC in the East End of Glasgow, Scotland also sing this. This year is the 50th anniversary of ‘You’ll Never Walk Alone’ being sung by supporters of Liverpool FC. The song is a show tune from the 1945 Rodgers and Hammerstein hit musical Carousel which began life on Broadway in New York. It was their second musical adapted from Ferenc Molnar’s 1909 play Liliom. Nettie Fowler sings it to her cousin Julie, a millworker, when her husband Billy, a carousel barker, kills himself to avoid capture during a failed robbery. It is reprised later in the show when Julie’s daughter graduates and the cast join in following the Dr Seldon, the town physician, advising the graduating class not to rely on their parent’s success or be held back by their failure. In 1999 Time magazine named ‘Carousel’ the best musical of the 20th century. It’s been a hit record for Gerry and the Pacemakers a Liverpool band in October 1963, Frank Sinatra, Judy Garland, and Doris Day amongst others. The songs message of optimism and common purpose is great for a choir and I hope I can do it justice on Saturday 9th November as a solo number. 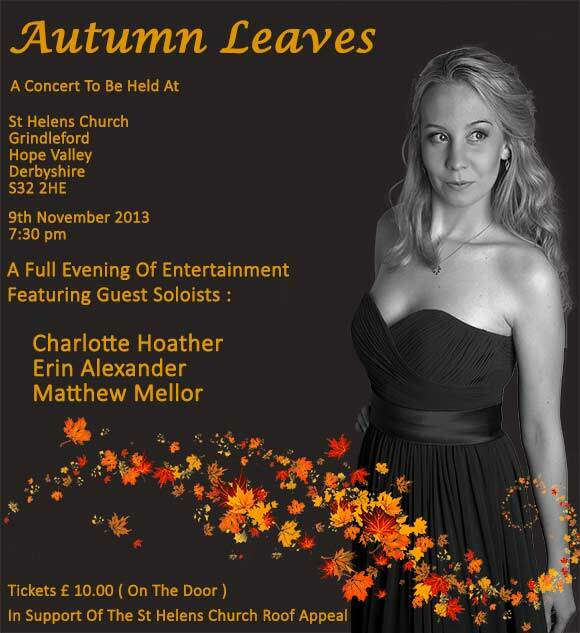 I thought it would be a suitable song for the remembrance concert ‘Autumn Leaves’ in Grindleford, Derbyshire. 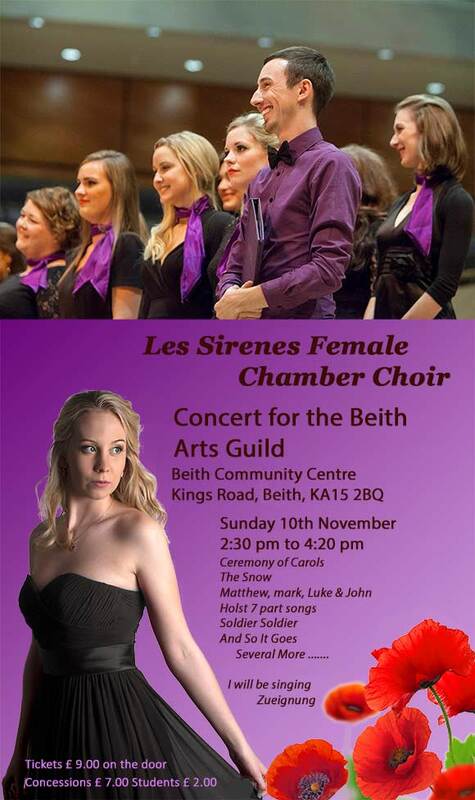 Then it is an early start and back up to Scotland for a concert in Beith as a member of “Les Sirenes”, the female chamber choir who in 2012 won the BBC choir of the year under the Musical Direction of Andrew Nunn. This will be a great opportunity for me as I have been asked to sing one of my pieces from the Kathleen Ferrier competition, “Zueignung”. I saw that first production of “Carousel” on Broadway, and the song swept everyone away. I am sure you will sing it beautifully. Awesome blog if you donate a dollar I will help fund or promote you. Please donate here http://igg.me/at/0ice/x/151273. Thanks for your offer Ace but I’m still at College. Hi Charlotte, Long ago, on the island of Oleron, I walked along the coast during a storm ….. amazing experience …. That’s sounds like a great adventure in Oleron. I’ve walked in a storm in the North of England seaside town called Blackpool, I used to love going to Blackpool to see the lights and fly kites on the beach with my brothers. There is a tower there with a glass floor walking area, it was inspired by the Eiffel Tower it is 158m high. I won’t be able to video on the 10th sadly but hopefully I may be able to record on the 9th I never know until the day. Blackport seam to be a lovevly place. Yes, it was a great adventure….I had gone to spend a week Oléron , during the autumn equinox . I spend my day walking along the ocean and write. One night it was a full moon , the wind singing in the streets of the village, I took my car to go to a deserted beach , facing the sea . Along the way, on a port, the car and people around a CB …. the flotilla was fishing at sea, they told me that there were wind gust to 140 km / h and low of 7 to 10 meters . So I go on a beach I knew it was low tide and the water was 200m from the dunes ….. Arriving at the top of the dune, wouaw , foam glittered in the moonlight playing hide seek with the clouds that déplaient gallop . monstrous waves were mourire 20m dunes , wind rugissaint with the ocean as a military tenor avahissant the beach , lightning tore the night was magical , because there was not an ounce of ” hatred ” as if nature was telling me do not be afraid, just look what I can following , listening , feeling , life ….. that night , I did not have my camera. Since when I spell it never leaves me . I hope to revive this spectacle of nature one day …….. Thank you 😉 Your oreo cookie cake looks fab by the way. In fact all your cakes look yummy. So uplifting. It has always been a favorite of mine. I’m sure you will perform it wonderfully in your solo appearance. I have always loved this song….beautiful! Hi Dennie, I’m glad to show you our version 😉 thank you. Lovely. I played Jigger Craigin in a production of Carousel in Wilton CT in the 70s and loved the production. It was an opportunity to sing which I had not done before. Got the part on acting chops in spite of no singing ability. Had a special arrangement of “Blow High Blow Low” to cover my tone deafness. Have always respected vocal talent since. Thanks for the memories. What a lovely memory I’ve stirred up for you John do you still do any drama productions? A beautiful song that carries many memories for us in the USA and worldwide as it was the official theme song of the Jerry Lewis MDA telethon and helped raise millions of dollars for the MDA fight against muscular dystrophy. That is cool that you will be a guest singer at the “Autumn Leaves” concert! It is ‘book week’ that week so I was planning to go home to study for the week with it being my birthday week so it fitted in perfectly 🙂 I’ve known Erin for years so it will be great to meet up again. As beautiful a song as you are a person. God Bless. Thank you so much for all that you post. Thank you for your blessings, I’m really happy you enjoy my posts. Very moving! Beautiful! Thank you for sharing your extraordinary gift! This was the song at my Junior High 9th grade graduation. And I have always found it encouraging. Hi Don, great choice of graduation song, we don’t really sing at our graduations, they are usually low key affairs, although one year when the Head of 6th form, Mrs Chambers, retired she asked me to sing at the graduation ceremony that year which was great. Thank you, yet again, what a brilliant article! I’m really pleased you enjoyed the article, I’m glad I researched the piece it will help me with the solo version. The Gawsworth concert was the first time I’d sung the song and I’d learnt a version with hold your chin up high so I had to adjust this very quickly or I’d have been completely out of sync. Charlotte you are so busy! Good luck with your concerts. It is an uplifting song. Thanks for visiting and for re-blogging my post. That is a great compliment Alex, thank you. I love that song! We watched the movie “Carousel” as kids, and I’ve loved the song ever since! I had no idea of the history of the play, though! Thanks for sharing. so emotional. I love your fashion tips, you have some great suggestions. I needed to hear an uplifting song such as this one today – thank you for sharing this post. Hi Julie, sorry for the delay, thank you for visiting my blog. Thanks for the follow. Love the sound and the message. Cheers! Thank you for your message and visiting my blog. Thanks for recently subscribing to my blog. I’m honored to have such a talented, stunningly beautiful young soul deigning to check in on what I have to say. You are incredible! Thanks for your visit and comment sorry I’m late responding. How lovely that your wife is a classical musician does she blog? You could be hard for other bloggers to find because your gravatar doesn’t link back to your blog 😉 I liked your post on trust. Thanks for telling me about my gravatar! Always glad when you drop by. No, Claire does not blog. I’ll work on that gravatar. It is always nice when you drop by. I’m glad it bought back memories for you 😉 Thanks for visiting. Thanks for making me aware that Molnár Ferenc got famous on Broadway, though I haven’t read Liliomfi yet. I should, you know, I’m a Hungarian after all.